Katherine Tegen Books, 9780062118936, 288pp. In this sequel to The Lost Treasure of Tuckernuck, Bud and Laurie solve another mystery at Tuckernuck Hall. This second hilarious installment is perfect for fans of From the Mixed-up Files of Mrs. Basil E. Frankweiler, Chasing Vermeer, The Westing Game, and the Mysterious Benedict Society books. 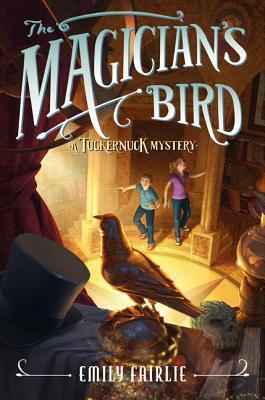 In The Magician's Bird, the mystery Bud and Laurie must solve is much more serious than a treasure hunt—their beloved school founder, Maria Tutweiler, has been accused of murdering Marchetti the Magician! Can Bud and Laurie—with the help of enthusiastic Misti and evil but useful Calliope—prove Maria Tutweiler's innocence? Or will Tuckernuck Hall be closed down for good? Emily Fairlie once again blends lists, notes, and classic prose to tell a story that sings with humor, suspense, and magic.